What is a hybrid smartwatch? So you want a smartwatch… but you don't want one of those gadgets that looks like a smartphone strapped to your wrist, and which is constantly lighting up and pinging you notifications. What is a hybrid smartwatch anyway? Want a deeper explanation of hybrid smartwatches? We've put together a full beginner's guide to watches with hidden tech under traditional faces so you know what to look out for. You're in luck: a new trend over the past couple of years has seen manufacturers making 'hybrid' smartwatches, which include some tech but look like a traditional watch. These are devices that look like a regular watch you'd pick up in a jewelry store, but which also feature smart tech such as step tracking, sleep monitoring and even notifications from your phone. We've tested lots of the big-name hybrid watches you can buy, and below we've put together a list of our favorite devices, ranked according to the features on offer, price, design, how well they work with your phone and much more. We'll be updating this list as we review more hybrid watches, but for now here are our favorite watches with added tech that you can pick up. The top hybrid smartwatch we recommend right now is the Misfit Phase, which offers a sleek and stylish design paired with some genuinely useful functionality when it's connected to your phone. Misfit's Phase is thick, but the design looks classic and no one will immediately realize you're wearing a smartwatch when you've got this wrapped around your wrist. The battery life is impressive – it'll last around six months with a single watch battery inside – but the fitness features here are limited, as there's no heart-rate tracker or GPS. Misfit's true highlight here, though, is the price: the Misfit Phase is one of the cheapest hybrids money can buy, so you'll want to get this if you're looking for an affordable watch that can buzz when you've got notifications and look great too. Looking for a small hybrid watch that looks fashionable but can track your heart rate and has a comfortable strap for the odd jog? The Withings Steel HR (sometimes known as the Nokia Steel HR) may be the perfect watch for you, and it sits in second place on our list of the best hybrids. It has a small second dial so you can see your daily step count (your target can be set in the app), and there's a small screen above it to show other stats. If you want to know your heart rate it'll appear on the screen along with your step count and notifications such as incoming calls, messages and events coming up in your calendar. There's a single button on the right of the watch that's sort of disguised as a crown, while the watch is waterproof, so you can wear it in the shower without ruining it. Is the Command a misfit? A year of battery life, notifications and some basic fitness-tracking tech are the highlights of our third-place watch: the Misfit Command. At first you may think this watch looks complicated to use, but it's actually quite easy once you know how it works. The days of the month are displayed on the right of the face outside the time markers, and the days on the week on the left. When you get a notification through to your wrist the watch will vibrate, and the sub-dial will display the notification type – text message, alarm or calendar notification; this dial also displays your daily step count. You can create contacts in the app and assign a number from 1 to 12 to each one, and the clock hands will point to the corresponding number when you get an incoming call. The two buttons on the right-hand side of the case enable you to play and pause music, among other things. The Misfit Command also looks great – we reckon it's one of the most attractive hybrid watches you can buy. The Withings Steel HR Sport is very similar to the Nokia Steel and Nokia Steel HR on this list (the company has recently been renamed Withings) and while the design looks similar there are some important differences. It comes with better notifications as well as VO2 Max monitor that will be able to give you an overall fitness score that you can improve over time. The battery is meant to last for around a month, and it has connected GPS and heart rate monitoring that means this is suitable for more fitness activities than a lot of other devices on this list. The Misfit Path is one of the most simplistic devices on this list, and while it does track some fitness stats this is much more designed to be an elegant timepiece than a flashy smartwatch. We love the long battery life - it should last around six months - and the fact you can customize one of the smart buttons for whatever you want from your phone. The Misfit Path isn't as affordable as some other hybrid smartwatches, but if you're looking for a trim piece of wristwear that'll look good this would be a great choice. The Withings Move is one of the cheapest devices on this list and you've got a great variety of different designs to choose from too. This is a good choice from you if you don't need many fitness features and you'd just like a way to track your daily step count and sleep with an attractive watch on your wrist. 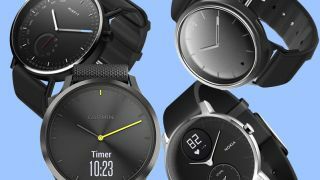 You've got 18 months of battery life, according to Withings, and while the watch doesn't come with top-end features like a heart rate tracker it is capable of tracking lots of your basic stats. The design and price are the key highlights here though, and while it won't suit fitness fanatics it may be your perfect idea of a simple hybrid smartwatch. While this is perhaps the sportiest device on our list, don't be fooled by the fact that it carries the Garmin name. The Vivomove HR isn't going to give you high-end running watch features like the brand's Fenix 5 range. It does, however, offer a heart rate monitor and step tracking, and there are also gym tracking features for when you're doing indoor cardio or recording reps during a weights workout. The Vivomove HR will also work in the pool as it's waterproof, but it's not particularly great at tracking your swimming, so don't buy it specifically for that task. There are stress-monitoring features, which is something you won't get on any other hybrid watch, and we found that these worked well. If you're after a good-looking watch with some hidden fitness features, the Vivomove HR from Garmin may be the perfect device for you. The Withings Steel is very similar to the Steel HR higher up our list, but there are a few key differences you'll want to know about. First off, it's a touch smaller than the Steel HR, making it a great option if you want a lighter and smaller device on your wrist. It also doesn't have a heart rate tracker, but there are features such as step counting and sleep tracking. There's also no screen on this watch, so you'll be relying on the smaller step count dial and the app to view your stats. The biggest difference between the two Withings (sometimes called Nokia) is the price – the Steel is quite a bit cheaper than the Steel HR, and that may encourage you to go for the smaller and more limited watch. One of the most stylish hybrid smartwatches available right now comes from Fossil, and it's called the Q Commuter. Fossil specializes in hybrid watches (although it makes Wear OS watches too), and this is one of the best-looking of the bunch, with a vast array of finish and strap combinations to match your look. The Q Commuter can give you a variety of notifications – although these are sometimes hard to notice as the vibration isn't particularly strong – and there are some limited fitness features here too. One of the real highlights is the battery life, which can run to a year or more. Next Page What is a hybrid smartwatch?